Your Personal Statement is the most important part of your University application. Let us custom write, edit, review and critique or critique and edit your Personal Statement to help you get that University Place! Please complete the form below to obtain a rough price estimate. Original, bespoke personal statements, written by professionals to your exact specification. A comprehensive critique of your personal statements by a professional writer, with improvement. A comprehensive edit of your personal statements to fully comply with the requirements of your chosen course. A full critique of your personal statement, a list of suggested improvements, and a full amend and edit service to polish your statement. Do you want your CV to be written by a MREC/CIPD CV Writer? Kick start your career today by ordering a high-impact CV from CV-Shop.com. 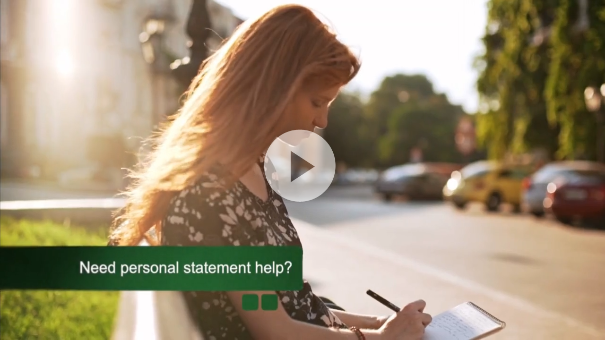 Personal-Statement.com is proud to offer you samples and tips to help you with your personal statement and it's free! Admissions officers read tens, if not hundreds of personal statements a day, how will you make your personal statement stand out? Your personal statement is the best tool available that allows you to ‘sell yourself’ in a way that will impress and charm admission officers so they pick you, and not somebody else. Competition for university places is becoming fierce, which is why you need an attention grabbing, vibrant and convincing way to get your place in your dream university, and this is exactly what an effective personal statement can achieve! Is the question ‘How do I write a personal statement’ running through your mind? Look no further! The pressure you can feel when writing about yourself is understandable, and having to write the perfect personal statement can be quite daunting… but this is where we come in! We will analyse your skills, interests, aspirations, achievements and hobbies, and transform them so they make you stand out in the crowd. Our professional writers will use their extensive experience to make sure that you are presented in the best possible way. We will use all of the information that you provide us with, to produce an interesting and exciting personal statement. If you want a custom made personal statement that will make you stand out and that will make your chosen University want you as part of their institution – contact us and we will help you achieve this. We offer a wide variety of services, all of which are covered by our comprehensive set of guarantees including no resale guarantee (every personal statement written by our team, is exactly what it says-personal, and will never be resold or published), no plagiarism money-back guarantee and top quality guarantee. By placing your order with us you can be confident that you will receive top quality service, delivered on or before your deadline. Our customer support team are available 8am – 11pm Monday to Friday and 10am – 6pm Saturday and Sunday. We are open daily to provide quick, efficient and useful support via e-mail or phone. We can custom write your personal statement based on all of the information you provide us with and our writers will incorporate all of your achievements and aspirations to ensure you impress your university. Get your custom-written personal statement from only £30.00. If you have already written your personal statement and would like it to be transformed into your ticket to university, we also offer a professional review and critique service. For only £58.00 a professional writer will review your personal statement and provide you with at least 10 recommendations that are GUARANTEED to IMPROVE your personal statement. You may have produced a personal statement and have a number of suggested amendments from your tutor. Or you may be struggling to combine all of the elements you need to write your personal statement. Two heads are always better than one, and our professional writers can work with you and your statement to make it perfect. Starting from only £24.00, our professional writers will edit your personal statement to incorporate your tutor’s suggestions, your own remarks and our writer’s recommendations. So you will end up with a personal statement that is full of ideas that will guarantee success. If you have written your personal statement, but you want to make it the best it can possibly be – we can offer you our most comprehensive service, which starts with a critique of your personal statement, along with suggestions for improvement. Once you have approved their suggestions, our experts will then edit your personal statement accordingly. From only £73.80 we will revise and edit your personal statement to give it that final boost. If you would like to see examples of our writers work, we also provide free personal statement samples written by our professional writers! For perfect and professional personal statements, you are in exactly the right place.